The City of Cincinnati is looking for bicyclists to share their thoughts about how the city is progressing with its bicycling infrastructure and policies. From now until December 31 bicyclists can give their feedback to the Department of Transportation & Engineering (DOTE) about what would make them feel safer and use their bicycle more often. In 2010 bicyclists gave the city an overall grade of “C” for its progress, just as they did in 2009, and city officials are hoping the feedback can help guide policy decisions to improve the atmosphere for bicycling in Cincinnati. 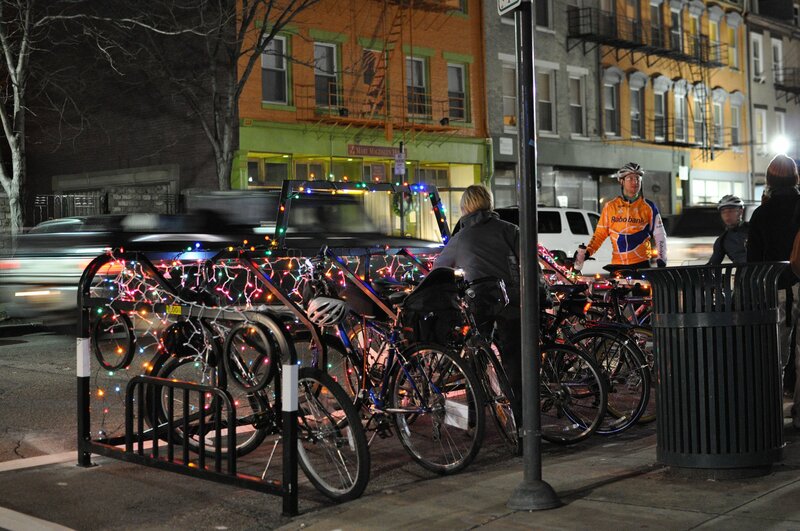 An on-street bicycle corral was installed on Main Street in Over-the-Rhine earlier this year. This is the third year in which the city has solicited such feedback to help guide its bicycle program. Over that time the city has also worked to implement new bicycle parking and lane infrastructure, along with new policies intended to improve bicycling culture in Cincinnati. Over the course of the past year, city officials tout the creation of a pocket-sized guide to Cincinnati’s bike laws, new sharrows on Madison Road, bike lanes on Martin Luther King Drive and Beechmont Avenue, the installation of an on-street bicycle corral on Main Street in Over-the-Rhine, and the completion of a segment of the Mill Creek Trail. The 2011 Report Card on Bicycling survey asks respondents to grade the city on its overall facilities and policies, while also asking what directions the city should take to improve its grade. Those interested can take the survey online now. It takes approximately five minutes to complete.